Armed only with an A5 paper bound copy of "How to Build a Folk Guitar" by John Bailey, purchased at the first ever Keele Folk Festival, Chris built his first guitar in 1966. 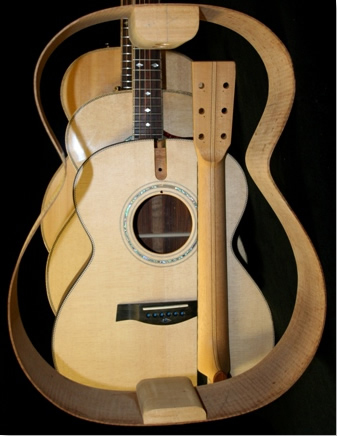 It was a 12 string acoustic inspired by seeing John Lennon playing one in a Beatles film. 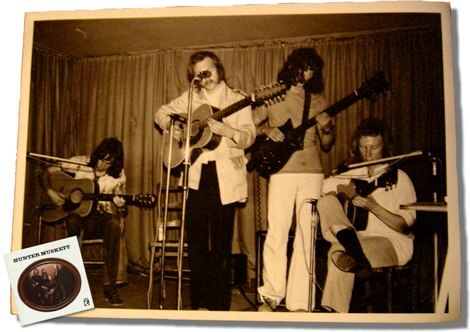 When at a South East London College, Chris built a nearly acceptable acoustic and formed a folk band called "Hunter Muskett". The band played George acoustics and electrics, toured at home and abroad for about 4 years and released 2 albums. Chris then moved from London to Lincolnshire and went back into teaching but still played and built guitars and boasted one of the best primary school guitar clubs around! After leaving teaching in 1998, Chris took guitar building more seriously, finally moving his workshop out of a spare bedroom into purpose built premises. In Dec 2004 one of his electric guitars was reviewed by Dave Burrluck for Guitarist magazine (UK) and was awarded Guitarist Choice. Dave subsequently had Chris build him two custom electrics - both with Variax electronics. He has also recently built him a hybrid nylon string acoustic which has featured in Guitarist magazine in April 2013 and in 3 long term tests since. Chris now specialises in building custom instruments, both acoustics and electrics, and tries to keep repair work to a minimum. Because of the demand of custom builds, he no longer offers refinishing or separate guitar parts i.e. necks, bodies etc. From about 1983 to 2012 Chris played with the band named "The South Chingford Rockets" (originally called "Chalky White and the HBs") The band no longer exists but most members are still making music. In 2010, following the Cherry Red re-release of "Every Time You Move" the four Musketteers decided to meet up again for the first time in 30-odd years and a "one-off" performance was arranged at The Aspinall Arms near Clitheroe. This had led to new dates, new songs and another album, That Was Then, This Is Now (Limefield, 2013). Since them Hunter Muskett continue to perform and record, with another album Unafraid and Sober released in 2017. You can find more information, tour dates and how to order the new CD at huntermuskett.com.